The PUMA Sportec is a light weight lock-back thanks to composition handles. A larger knife for bigger needs, the PUMA Sportec is the choice for outdoorsmen who have some major league work to do. 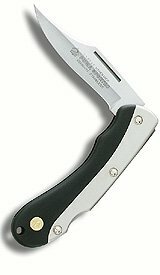 With a 3-1/4" blade, this is a knife for big jobs and needs. Thanks to premium German craftsmanship, this PUMA pocket knife will be ready to get work done whenever you need it. Fully extended, the PUMA Sportec is 7-3/4" long, and its blade holds an edge throughout frequent and repeated use. It folds down to 4-1/2" for carrying and, despite its size, it can be carried comfortably between uses, thanks to the nylon pouch that comes with it. It is easy to grab when it is needed and easy to put away when you are finished with your task. This German knife feels just right in your hands, thanks to the zytel and zinc composition handle. This gives it a reassuring, solid grip to go along with a substantial heft that does not feel heavy during use. For the man who needs a larger blade for big jobs, this knife is an excellent choice. It is large enough for big jobs, but folds down small enough to make it good for easy carrying. This rugged, durable knife is a workhorse that will stand an outdoorsman in good stead for a long time to come. With its dependable German design and superior craftsmanship, you can take the Sportec with you on any adventure. Return from PUMA Sportec to the German-Knife.com home page.